Coach Saban is working hard to keep Alabama focused going into the Tennessee game. 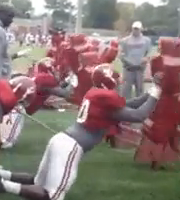 Here you can see the defensive line getting after it on the sled in preparation for playing the Tennessee Vols. There is no slacking and they will be ready for the Tennessee offensive line.